Sashimi, whether in tuna or salmon is perfect as a beer buddy. You don’t even have to purchase expensive servings from Japanese restaurants to have one. You can make a homemade version through ingredients that are readily available through a local supermarket or grocery. 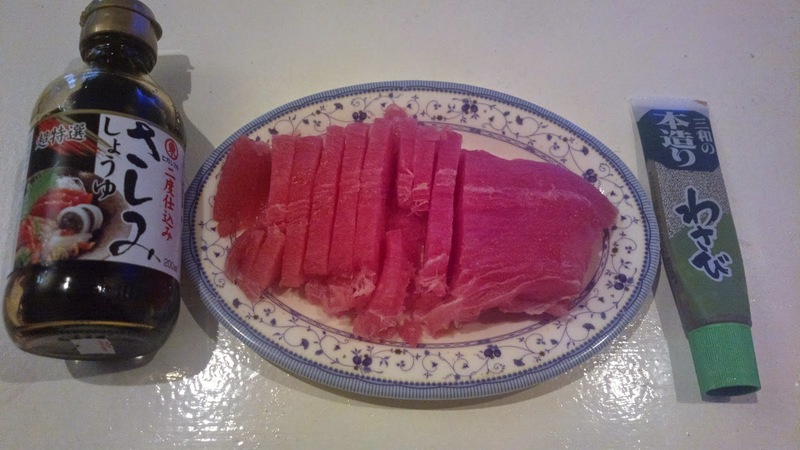 What you will need is either a tuna or salmon fillet from the wet or meat section. It is normally going to cost around Php 200 or higher depending on the size. Next, head over the spices or condiments area and look for a Japanese soy sauce and wasabi paste. These will cost over Php 200 each as well. If you can’t find them in spices or condiments area, it should be in the Asian or specifically Japanese products racks. If you still can’t find it, ask a sales attendant. Any large supermarket or grocery will have these and you don’t need to purchase them from specialty shops. To prepare, simply wash the fish meat and cut into your desired size. The ideal is of course small strips similar to how sashimi is served in Japanese restaurants. Plate the fish onto a platter or plate with wasabi paste spread on one side. This allows everyone to take only the portion they can tolerate. Wasabi is really spicy so be careful. Lastly, the soy sauce is poured onto a bowl. There’s no need for any additional ingredient. Japanese soy sauce is unlike our local brands and comes with a delectably unique taste that can stand on its own without adding anything else.